Welcome to Anna Maria Island ''paradise without an attitude''. 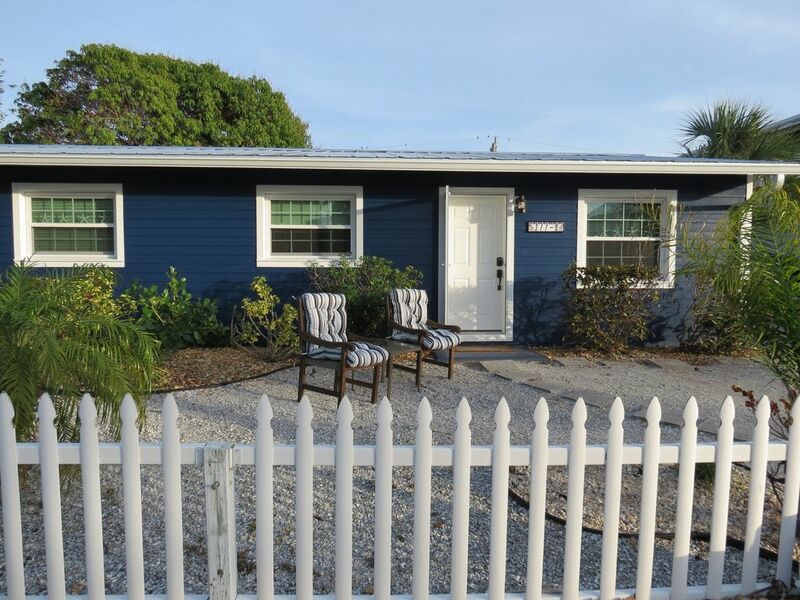 Our ground level ' Old Florida Key West style' units are located in the village of Anna Maria on a quiet residential street, a short stroll to the sugar white sand beach. Free trolley stop, shopping, a variety of restaurants, both fishing piers, the island community center are all within walking distance. Many local concerts, festivals, art & craft shows and fireworks depending on the season of your visit. With Bradenton, Sarasota and Tampa so close your can be as busy as you like with endless activities or quietly walk the beautiful beach, watch the dolphins swim pass while you wait for the spectacular sunset. We have land line internet and wifi , unlimited long distance calling in the US & Canada. Tiled floors and beautiful screened lanai. Fenced in large yard with patio and will consider pets. Central air, washer/dryer, gas BBQ, beach chairs, off street parking. Rent everything from bikes to boats around the corner. Discounts given for month or longer stay. Great host and hostess, great location for walks in town, restaurants, beach and great fenced in backyard for our 2 terriers. Felt right at home. This is not our first time to the Island. We loved this beach cottage. It is perfectly located. Close to the Sandbar and a short walk to Rod n Reel pier. With the Gulf at one of the street and the bay on the other end. We never had to use the car and fight for parking. The cottage is very well maintained, clean and has that beach feel. We will definitely visit again. We had a wonderful Thanksgiving at this little cottage. Perfectly located for walking to the beach and to restaurants and shops. Absolutely loved the screened porch, where I spent most of the time reading with my dog at my side (a big "thank you" for allowing pets!). Very private back yard with lovely landscaping. I can't say enough about how much we enjoyed our stay! We hope to be back soon! I am happy to hear you enjoyed your stay. I hope you return again soon. Clean, cute, close to everything you want on AMI. Pet friendly big bonus! Very comfortable, close to all the restaurants and beaches. The cottage was very nice. Everything was clean and well maintained. Had everything we needed. Great location close to coffee shops, restaurants, ice cream shops, and the beach. The only thing that needs improvement is the beds. Mattresses were not very comfortable. Would definitely stay again. Pets are considered must be approved by owner. Owner of pet must clean up after pet and not allow excessive barking. Pets must be on flea protection. No pets are allowed on any of the beaches, $ 500.00 fine. Discounts given for month or more stay. 12% tax required by Florida regulations. Check out policy, the cleaning company has a policy if you are not completely checked out by 10am when they arrive for the scheduled cleaning they charge an additional $ 250.00 to return and clean. This $ 250.00 charge would be deducted from your refundable security deposit. Please make sure you are completely checked out by 10am on your scheduled day of departure. nightly rate is based on double occupancy. Extra adults are $25 per person per night. No unauthorized guests allowed will result in loss of security deposit. Maximum 4 people in unit (including children) No more than 2 cars allowed at the unit. The city of Anna Maria charges me for excessive noise violations this charge will be taken from your refundable security deposit and you will have to leave the property immediately with no refund for the rest of your reservation. No smoking in unit. I do rent for under 7 nights however not until 3 weeks before the dates.